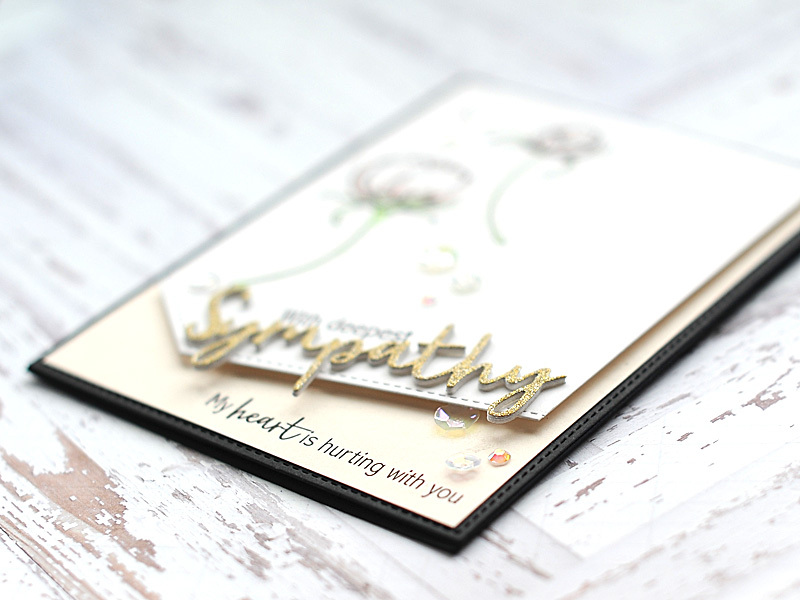 Today we are featuring the Heartfelt Sympathy stamp set and the coordinating Sympathy SugarCut. I've paired them with two of the items we featured yesterday, the Pretty Peonies stamp set, the Card Front Element Builder SugarCuts. Now on to my card, and first I want to say something about this amazing stamp set. If you've been a follower of me at all, you are aware of the tragedy that has surrounded me in the past few years. I've received a lot of sympathy cards, and sometimes, they really didn't bring me any comfort. Wendy did such an amazing job making sure that the sentiments in this stamp set are heartfelt & comforting, and I can absolutely stand behind using it for such a sensitive time. With all that being said, I loved the color palette that I used on my card from Release Day 1 so much that I used it again today! To start, I cut & folded an A2 card from black heavyweight cardstock. Then I diecut the stitched background from matching cardstock and adhered it to the front. Next I cut a block of cashmere cardstock slightly smaller, adhered it to the middle & stamped part of the sentiment to the lower right corner use onyx black Versafine ink. Then I cut a block of white cardstock slightly thinner than the cashmere cardstock, and diecut the stitched angle to the bottom of it. Next I arranged the flowers on the left side of the white cardstock block, and stamped them using my MISTI. I typically always use my MISTI when stamping images like this, just in case I don't get the crisp image I want the first time. I then used my MISTI to align & stamp the "with deepest" part of the sentiment. Then I lightly colored the flowers using my Zig Clean Color Real Brushes in pale pink & light green. After coloring, I added some shimmer to the flowers using my clear Wink of Stella pen. Next I diecut the word sympathy four times - once from gold glitter paper, and three times from white cardstock. I layered them together to give the sentiment some rigidity, then adhered it along the long side of the angled cut on the white cardstock block. With the stamped block completed, I adhered it to the card front using foam adhesive. The final step was adding clear or iridescent sequins & jewels to the front. 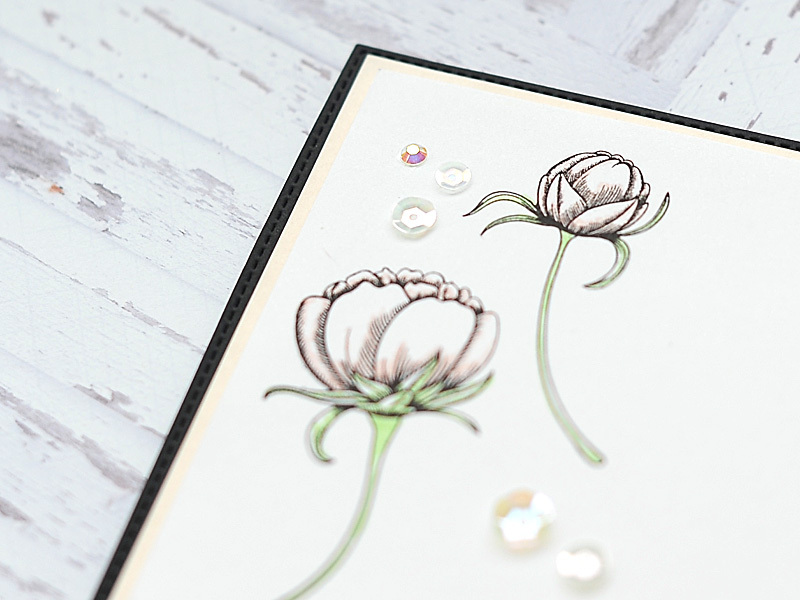 I wanted these to be subtle, so I specifically chose colorless accents to give the card a little extra something while maintaining a light & peaceful feeling. 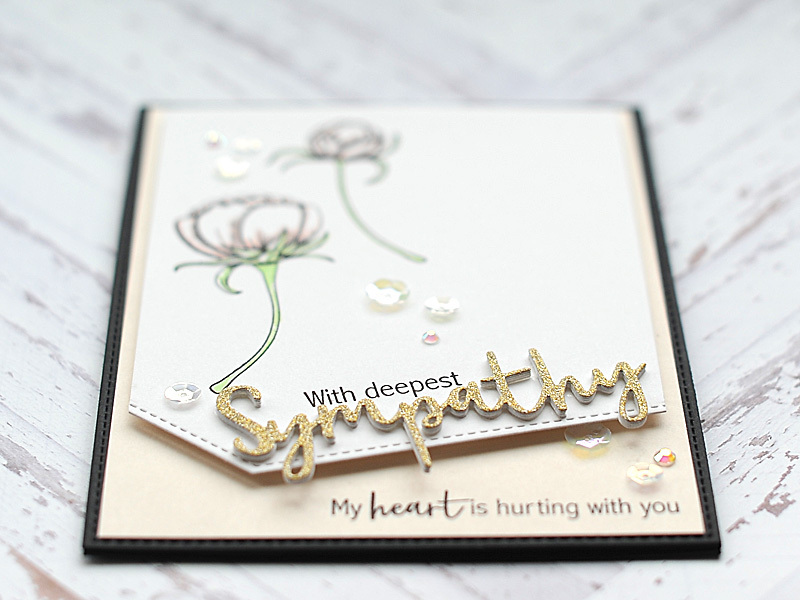 Click on the banner above to take you to the SugarPea Designs blog, where you can learn more about today's products, and leave a comment for your chance to win the Heartfelt Sympathy stamp set. Be sure to hop along & check out all the amazing creations from the SPD designers & guests - leaving a comment at our blogs gives you extra entries into the giveaway! 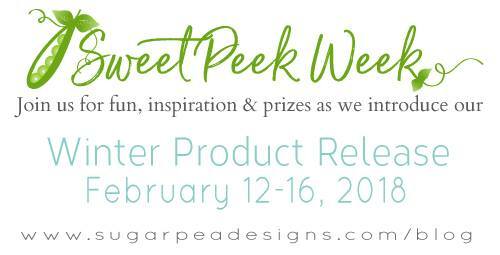 I will be back tomorrow with another card featuring brand new products from SugarPea Designs! It is a super bright & bold card - a little unusual for me, but I love how it turned out! Pretty card! I love the sparkle on your sentiment! I like the stitched angle that you gave to the card. Perfect placement for the Sympathy die cut. I love the unique style. Beautiful card. Gorgeous card... beautiful without being over the top. Gorgeous card! Love the simple accent touches and all the layers you included. Such a gorgeous, soft and beautiful card! Beautiful card! Love your soft coloring! So elegant. I like the die you used. Beautiful card. Love the flower buds. Plain and simple and great. Your card is gorgeous! I really like this sympathy stamp set. Simple, yet so elegant. That's a wonderful sentiment for such an occasion. Love the design and soft elegant colors! So pretty! Beautiful details on your lovely card! This a very nice card. Love the pale coloring used. elegan and super beautifulu card!!! Gorgeous and elegant card - love the soft colors. Your card is absolutely beautiful !